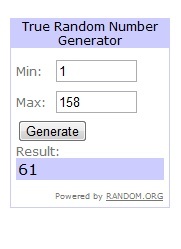 It's time to choose a lucky winner!! But first, a huge thank you to all of the super sweet comments you left about my Double Dresden Delight!! I was just tickled pink with them. You all sure know how to make a gal feel great. And I hope I see lots of Double Dresden Delight's start popping up here and there :) It really is a fun little quilt to put together!! Now . . . Let's get onto the winner. And I am off to tidy up the house. My Mom and Dad are arriving today to spend the rest of the week with us. My dad competes in the Utah Summer Games each year and since they are in Cedar City they get to come and stay with us :) Which means my mom and I will have lots of time for sewing. (she is bringing down her machine :) I am so excited! !